From the Continuing to Beat a Dead Horse department. All Sounders FC fans who were not in the stadium for the DC United match (and many who were) were left feeling dissed, by ESPN. As one who was unable to attend the match, I was livid. I was hoping that a bit of indignation we felt would be voiced by the MLS Commissioner. In the June 19 edition of MLSnet.com’s “The Commissioner Speaks” Mr Garber was, for my taste, a wee bit under spoken in his response. We had a very exciting and entertaining match on ESPN2 between Seattle Sounders FC and DC United at Qwest Field. Unfortunately, the College World Series game that was the lead-in to the match went into extra innings and delayed the broadcast of the match. We’ve had many inquiries from fans regarding the broadcast delay. It is ESPN’s company policy that the network stays with live events on their networks through the completion. This policy is part of our agreement with the network. The same situation would occur if an event was following a live MLS event that ran over the allotted time. ESPN was prepared with studio updates, alerts and cut-ins so that our fans could be informed on the game status, but clearly it was very disappointing that our fans couldn’t see live a great demonstration of MLS at its best. If you missed the game on ESPN, the full game is available free of charge on MLSnet.com. I don’t know if I’m the only one who was a little disappointed in the two public paragraphs on the subject. I don’t know what I expected. After all, the league got paid by the network for the rights to show the match, such as it was. That’s the point of getting televised isn’t it? TV revenue. Perhaps that’s why Mr Garber chose not to rock the boat in public. Didn’t want to bite the hand that feeds him so to speak. I understand that. I understand agreements. I just hope that for the future, the agreement either states MLS matches will follow programming with a time limit, or that there is an option to move it to one of ESPN’s several channels that do not contain live sports events. If there is no guarantee to show it in it’s entirety, than the local channel needs to retain the right to broadcast it. Some people would call for ditching ESPN altogether and getting a good deal with FSC, and perhaps being treated with more respect. On the surface, that sounds good, but at the moment it would decrease the potential number of viewers. 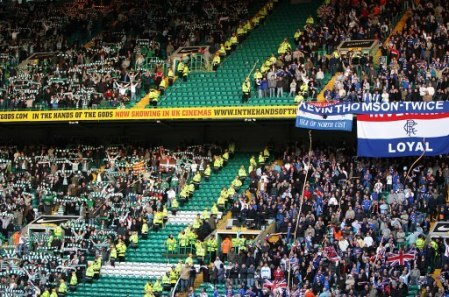 We the fans, need to make ourselves unable to ignore. WE need to not just make noise when we’re angry, we need to give kudos to all networks who show soccer at any level in any league. We need to patronize the sponsors, and spend some time firing off letters and e-mails to let them know we appreciate them providing the bucks needed to televise the MLS. I had the privilege of working in the NASL for part of the 1976 season while in college, and then for three years as the head athletic trainer for the San Diego Sockers. (1980-1983) In 76, the San Diego Jaws played in the open air toilet known as the Aztec Bowl. It was an ancient stadium, built in 1936, that held in the neighborhood of 12,000. It was narrow, bumpy, and only half covered with grass. It was located on the campus of San Diego State University. so we can only imagine what the average was, not counting the games he played. Speaking of Pele, the Jaws moved their game with the Cosmos to the larger Balboa Stadium, downtown. What a circus it was. The kick-off was delayed 30 minutes or so as we waited for the helicopter that was carrying the game ball to arrive. 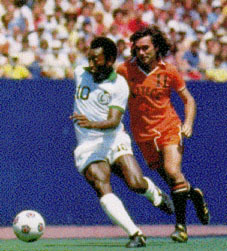 At the end of each game, Pele would honor a player from the opposing team by swapping jerseys with him. That night the Pele MOTM was goalkeeper Alan Mayer following a nil nil draw. By the outdoor season of 81, the league average attendance was 14,084.Fourteen thou for an average! Consider that the Cosmos drew 34,835, Tampa Bay Rowdies drew 22,532, and up the road, the Whitecaps averaged 23236. The Los Angeles Aztecs Drew 5,814 a game while playing in the Coliseum. One Sunday afternoon we were at the coliseum. You could hear Ron Newman’s voice echoing off the approximately 84,000 empty seats. The announced attendance was 6,000. I think they counted the Vendors, ushers, and players. Television coverage was a fantasy back then. There was scattered local coverage for some franchises, but no national identity. For that matter, we had to watch the spanish language station to catch a World Cup match. Guys had to call overseas to get scores. Whenever a match was shown for novelty value, they ran commercials as if it were NFL or MLB. While I don’t want to come across like some old geezer talking about how bad we had it back in our day…okay so that’s exactly what I’m doing. Just consider how special this franchise in Seattle is, even by today’s standards. The league is healthier than what existed back then. We’ve got local TV coverage for Every game. The league is covered by FSN, as well as ESPN2. So there isn’t the support that there is in Europe. Probably never will be. So What? Let’s enjoy what we’ve got. Can it get better? Of Course. Let’s enjoy the ride. In 1974, the San Jose Earthquakes began playing at Spartan Stadium. A family friend worked for the club, and got us tickets whenever we wanted. It was a small field, but a fantastic atmosphere. It was San Jose’s first professional franchise outside of minor league baseball. There was a buzz all over the South peninsula. The crowds were rowdy and passionate. This was soccer at it’s highest level in the U. S., and the fans were an example to the league of how to support their club. The place held 18,000, and it was rare to find an empty seat. I was hooked, and looked forward to the games. Years later (80-83), I was the head athletic trainer for the San Diego Sockers. Some of my favorite trips were to Seattle to play the Sounders. I loved the facilities at the Kingdome. The crowds were great. Even though the cavernous state of the place prohibited the intimate feel that Spartan Stadium had, The passion of the fans was palpable. It was a grand disapointment when the Sounders folded amidst a crumbling league. For the rest of the decade, the american brand of professional soccer was mostly played in sports arenas with Astroturf laid down over hockey ice. After we moved to The Puget Sound Area, We were happy when the Sounders were resurrected in the 90’s. When the MLS announced the new frnchise in Seattle, we decided to spring for season tickets. We’re counting down til Thursday’s kickoff. I’m flashing back to the summer of 74 when I saw my first professional soccer game. With the lower bowl mostly filled with season ticket members I’m anticipating the type of atmosphere we had in San Jose. There is a buzz around the area. The crowd will be rowdy and passionate. This is the game at it’s highest level in the U. S. Let’s show the rest of the league how to support it’s club. On Thursday, Jean and I will be at the Seattle Sounders FC Inaugural Season Opener VS the New York Red Bulls. We’re both pretty fired up about it. It’s great to see the highest level league come to the city. It’s the first time I’ve ever had season tickets for any team. Fortunately, we got the tickets before the layoff. They’re paid for, and we can low budget most of the games. This has some sentimental value as we met on a blind date at an indoor soccer game in April of 87. We’ve been looking forward to this since the city was awarded the franchise. I’ll report back on Friday. This page took 1.314 seconds of computer labor to produce.